There’s nothing better than homemade whipped cream—and it’s very easy to make. Photo by | IST. Pastry chef Bo Bartlett, owner of Daphne Baking Company, makes wonderful gourmet tarts, a NIBBLE Top Pick Of The Week. She serves of whipped cream with her tarts, and has created some special flavored whipped creams, which she shares with us here. You can use them with any dessert—tart, cake, pie, pudding or ice cream—that has matching flavors. This is Page 1 of a three-page article. Click on the links below to visit other pages. Once you make your own whipped cream, you’ll never go back to store-bought aerosol cans. The recipes below give instructions to whip the cream in a bowl with beaters; however, if you you want an even easier way to make whipped cream that you can prepare days in advance, consider a cream whipper. We’ve used whippers from iSi for many years. Cream whippers, as they are known in the industry (consumers tend call them “whipped cream makers”) are terrific kitchen gadgets. You pour the cream into a canister, add the sugar and flavoring, and then aerate instantly with a nitrous oxide charger instead of whipping for 5 minutes with the beaters. All of the whipped cream is good to the last drop; it stays fresh in the refrigerator for up to 10 days. Your cream will be more highly aerated (airier, not thick) and will emerge from the nozzle of the whipper in a thin ribbon, as opposed to a rounded mound as large as you like, from a spoon. It’s also environmentally friendly: There are no aerosol cans to throw out. You simply wash and reuse the brushed stainless steel canister. It’s far better than supermarket aerosols (in a blind taste test, consumers preferred fresh whipped cream from an iSi cream whipper 3 to 1 over leading aerosol brands). A Note About Aerosol Cans: Aerosols used to have a bad name; the propellant used to force the aerosol out of the can, a CFC (chlorofluorocarbon), was found to deplete the ozone layer. Aerosol cans now use a hydrocarbon gas, nitrogen or air (depending on the contents). There is still the environmental issues of a non-reusable cans vs. a reusable cream whipper, but there are no more ozone-related issues. Reddi-Whip contains cream, nonfat milk, corn syrup, sugar, natural and artificial flavors, carrageenan (a thickening agent), mono- and diglycerides (emulsifiers, to preserve the texture of the product) and nitrous oxide as a propellant. Homemade whipped cream contains cream, sugar and natural flavors (vanilla, almond extract) and no other additives; if you use a cream whipper, then you, too use nitrous oxide as a propellant. The amount of heavy cream you use—one half or one pint—yields up to five times as much whipped cream. You can use a cream whipper for espumas (foams), gravies, sauces and soups. In fact, there’s a thermal version that keeps the contents cold for up to eight hours with no refrigeration needed, or hot for three hours—on the kitchen counter or the buffet for people to help themselves. This is the classic recipe for whipped cream. However, if your dessert is particularly sweet, such as pecan pie or chocolate mousse, you should consider cutting the sugar in half or eliminating it completely. Very sweet whipped cream on top of a sweet dessert doesn’t allow for counterpoint. While everyone at THE NIBBLE has a sweet tooth, we prefer a less sweet whipped cream (or even the slightly tart crème fraîche). You can try reducing the sugar in all of the recipes that follow on Page 2, as well. Chill the bowl, beaters and cream thoroughly before beginning. 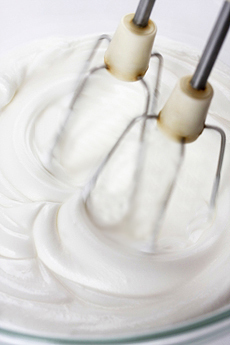 Using an electric mixer whip the cream, vanilla, and sugar in the chilled bowl until soft peaks form. Makes about 2 cups.